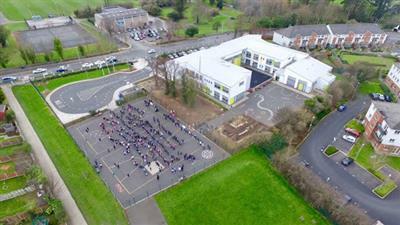 Is scoil dhá shruth í Gaelscoil Eiscir Riada a d’oscail Meán Fómhair 2005 le beirt mhúinteoir, Príomhoide san áireamh mar gur thosaigh coiste áitiúil feachtas chun an dara Ghaelscoil a lorg do Leamhcán. Bhí 26 dalta ar scoil nuair a d’oscail an scoil ar an gcéad lá de Mheán Fómhair 2005 agus bhí an scoil lonnaithe i halla CLG na Sáirséalaigh. Bhogamar suas chuig seomraí réamhdhéanta ar Bhóthar an Ghrifín i Meán Fómhair 2006 agus táimid ag fás agus ag forbairt anseo ó shin. Fuaireamar aitheantas buan ón Roinn Oideachais agus Eolaíochta i Bealtaine 2006. Fuaireamar foirgneamh buan álainn i Mean Fómhair 2012. Tá an scoil lán anois le 2 shruth de gach rang ó Naíonáin go Rang 6. Tá dhá éiteas ag an scoil, Éiteas lán-ghaeilge agus éiteas Caitliceach. Is Gaeilge an teanga cumarsáide in ár scoil. Leanaimid an cúrsa reiligiúin Caitliceach, ach tá fáilte roimh páistí le creideamh eile agus gan creideamh ar bith chomh maith. Síneann Eiscir Riada ó Eiscir i Leamhcán chomh fada le h-Eiscir i gCo. na Gaillimhe. ‘Séard atá ann ná eiscir (ridge) de ghairbhéal agus carraigeacha a préamhaíodh tuairim is 10,000 bliain ó shin san aois-oighir. Chomh fada siar leis an dara aois d’aontaigh Conn Céad Cathach agus Eoghan Mór go mbeadh Eiscir Riada ina líne dhealaithe ar Éirinn. Thug na Ceiltigh “An tSlí Mhór” (“The Great Highway”) ar Eiscir Riada a roinn an tír ina dhá leath – Leath Chuinn agus Leath Mhogha. Tá an scoil faoi Phátrúnacht an Fhorais Pátrunachta na Scoileanna Lan Ghaeilge Teo. Scoil le ethos Caitliceach atá ann. Foghlamaíonn na páistí gach ábhar (seachas Bearla) trí mheán na Gaeilge. I Naíonáin Shóisearacha ní dhéantar aon Bhéarla ar chor ar bith cé go ndéantar na scileanna réamhléitheoireachta trí Gaeilge. Glaotar Tumoideachas ar seo agus tá sé an-éifeachtach, le páistí ag labhairt Gaeilge roimh dheireadh Naíonáin Shóisearacha. Mar atá faighte amach ag tuismitheoirí na scoile, ní bac ar bith atá ann gan Gaeilge a bheith acu sa bhaile ach cabhraíonn sé leis na páistí go mór má tá meoin dearfach ag tuistí ina leith. Gaelscoil Eiscir Riada opened as a new two stream school in September 2005 with two teachers, including the Principal. A local committee began a campaign to set up a second Gaelscoil in Lucan. There were 26 pupils on the first day and the school opened on 1st September 2005 in the hall in Sarsfields GAA. We moved to temporary prefabs on Griffeen Road in September 2006 and have been growing and developing here since then. We were granted permanent recognition from the Department of Education and Science in May 2006. We got our lovely new permanent building in September 2012. We now are at full capacity with 2 streams of each class from Junior Infants to Rang 6. 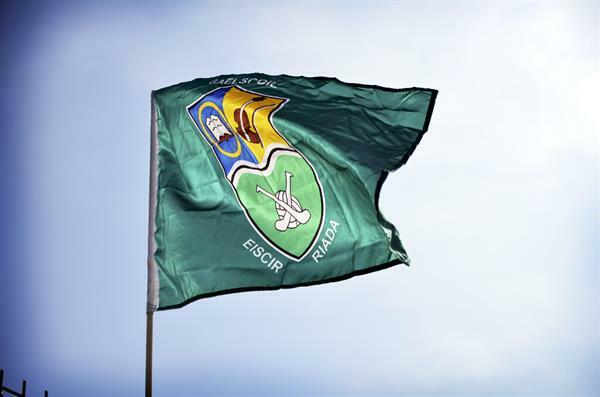 The school has a dual ethos, the Irish language ethos and the Catholic ethos. Irish is the language of communication in our school. We teach the Catholic religion programme, but also welcome children of other religions and those with no religion. The Esker Riada extends from the village of Lucan to Esker in Galway. The word “esker” seems to be an Anglicised version of the Celtic word “eiscir” (meaning ridge) consisting of sand and gravel – a relic of the ice age dating back approximately 10,000 years. In the 2nd century, Conn of the 100 Battles and Owen Mór agreed to the Eiscir Riada being the dividing line of Ireland. To the Celts the Esker Riada was known as “The Great Highway” which divided the country into two halves known as “Conn’s Half” and “Mogha’s Half”. The school is under the Patronage of An Foras Patrúnachta na Scoileanna Lán Ghaeilge Teo and has a Catholic ethos. The children learn all their subjects (except English) through Irish. In Junior Infants the children do no English at all, although they do learn all the pre-reading skills through Irish. This is called Immersion teaching and it is extremely effective as the children can speak the language by the end of Junior Infants. As our school’s parents have learned, it is no drawback to have no Irish at home, but it does help to have a positive attitude to Gaeilge.